Nancy Barton’s performance is a collaboration with her mother, Marjorie, a former opera singer, who abandoned her musical career to become a stay-at-home caregiver. 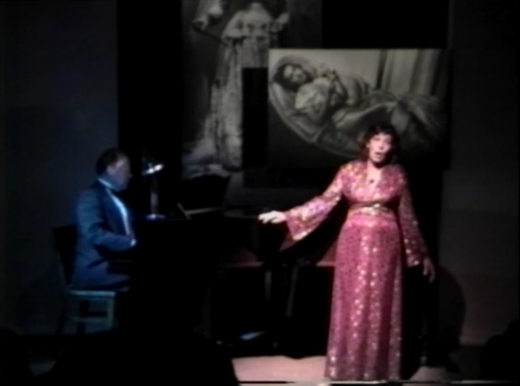 In the form of a lecture, Barton uses pre-recorded excerpts from interviews with her mother, slides of family photos, and feminist theory citations by Catherine Clément, Hélene Cixous, and Luce Irigaray that address melancholy, repression, inferiority complexes, and the tragic female role of the diva in opera. Barton analyzes and compares her mother’s lived experience and societal expectations of women in the 1950s to explore what may have prevented her mother from pursuing her dreams in opera, settling for a domestic partnership instead. Barton’s Swan Song is part of a larger project that took place over a span of six years. As an installation, Swan Song is a series of opera posters that retain the design, format, typography, and names of the opera singers from the original productions, substituting her mother as the depicted heroine figure. The artworks are titled after the leading female roles in the operas, and are mounted on formica to mimic granite or marble, a surface where such a poster might be found. Barton also includes text excerpts: interviews with her mother, librettos from the promoted opera, personal thoughts, and feminist theoretical writing. Following the death of the artist’s father, Marjorie experiences a newfound independence that causes Barton to re-examine her parents’ relationship in an attempt to help her mother “regain the happiness” that she experienced before marriage: “I wanted her to be strong and independent…I thought by saving her, I could save myself.” At the end of Barton’s autobiographical lecture, Marjorie comes onstage in a dazzling dress and sings a series of operatic works and popular oldies with piano accompaniment by Theodore Crain. Marjorie skillfully performs her soprano repertoire, fulfilling both her own forgotten musical ambitions and Barton’s fantasy for her. But the singing performance is bittersweet. The audience, now privy to Marjorie’s personal history and the conventions of opera, must contend with the conventional narrative of the diva as the inevitable subject of tragedy and cliché. 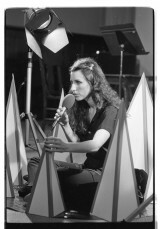 Swan Song is a performance that was held at Western Front in conjunction with an exhibition of the same name that took place off-site at Presentation House Gallery from October 19-November 24, 1991. With Marjorie Barton. The artist’s mother sang serious and light operatic pieces, accompanied by pianist Theodore Crain. A slide dissolve of family photos was interspersed, as were audio interviews with mother and daughter. Concurrent with an exhibition of the same name at Presentation House. Co-sponsored by Presentation House.